Keep reading to learn about the eight adventurous and family things to do in Arizona. Bring lots of sunscreen! Head to the Coyote Buttes ravine and you’ll see The Wave, a massive sandstone structure that stands about 5,225 about sea level. The rocks have been hardened over time and prone to damage, and for this reason only 20 visitors a day are allowed to walk through the ravine. However, you need a permit, which can be obtained online or in Flintstones Bed Rock City. For a unique experience, stay at the Grand Canyon Caverns Underground Suite. Keep in mind that this may not be suitable for younger children. But if you have teenagers or college kids, they may think it’s cool to stay 22 stories underground. There’s only one room available so make sure you book in advance. Mystery Castle is located in the Foothills of South Mountain Park and open until the end of May and closed from June – September. It was built by Boyce Luther Gulley over a 15 year period. But it’s a mystery because he left his job, wife and child and disappeared for three years before turning up in Phoenix and building the castle. Unfortunately, Mystery Castle is not wheelchair accessible so keep this in mind when visiting with kids and extended family, e.g., parents and grandparents. Petrified Forest National Park is located in Navajo and Apache counties in northeastern Arizona and covers about 170 square miles (440 square kilometers). Approximately 800,000 people visit the park and partake in activities such as backpacking, guided programs, hiking, and sightseeing. Kids can complete a booklet to become a Junior Ranger. It’s a great place for amateur and experienced photographers. 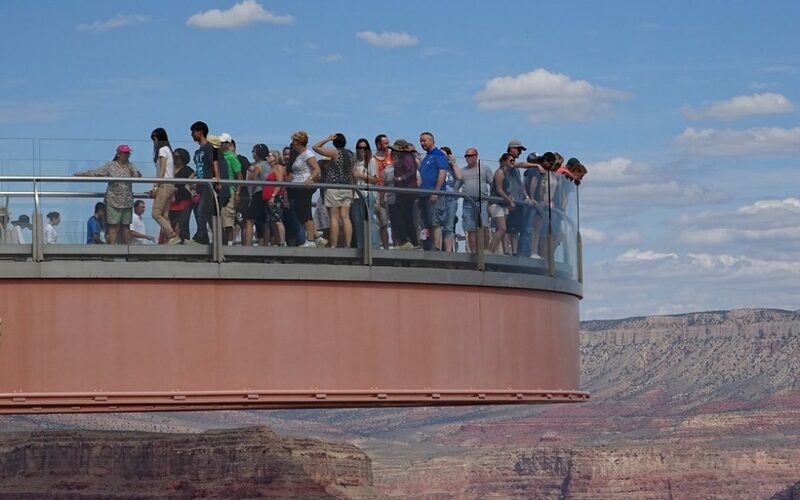 If you have a fear of heights, Skywalk Grand Canyon (see the picture above) located at Eagle Point could make your heart race and feel as if it’s about to jump out of your chest. But for those who are adventurous, you’ll love standing on the horseshoe-shaped bridge and being suspended over 4,000 feet about the riverbed. If you don’t feel sick to your stomach, you can buy cold drinks, hot lunches, and snacks. Have you seen The Wizard of Oz? One of the best scenes of the movie is when the professor sails away from Oz in a hot air balloon [spoiler alert] and says that he doesn’t know how it works. But don’t let this scare you! You’ll find plenty of experienced hot air balloon ride operators in Phoenix. Gather your family and soar above the desert and take-in the beauty of Phoenix. One of my favorite parks, South Mountain Park/Preserve, offers you and your family great biking, hiking, and horseback riding experiences. If you visit Phoenix in the summer, take extra precautions when you’re outdoors. Bring plenty of water and pace yourself. If you have younger kids, you may want to stay inside and/or hang out at poolside at your hotel and resort. Does your family prefer winter sports like skiing and snowboarding? If they do, then you’ll want to visit Arizona Snowbowl in Flagstaff with its snowy peaks and chill-looking pines. Whether your family members are seasoned pros or beginners, they’ll have fun testing and developing their skills. Are You Ready for Family Adventure in Arizona? Picture your adventurous family traveling to Arizona for fun in the sun during spring or Christmas break. Since it may be cold and snowy where you live, you look forward to leaving Jack Frost behind for a while. Instead of shoveling snow, you hike South Mountain Park and take-in the views of Phoenix. From there you drive to Tempe Kiwanis Park and let the kids play on the playground. After they’ve finished, you grab their hands for a quick stroll around the park. Not only do you stay in a great Phoenix hotel, but you explore everything that Arizona has to offer. Doesn’t this sound good? Yes, it does! If you’re ready to take a family adventure vacation to the desert, email and ask me about planning your Arizona experience. I lived in Chandler, Arizona for a few years and loved exploring the state. I can share my best tips with you. Want to learn how more information on how to plan your family vacation? Get this FREE family travel guide.